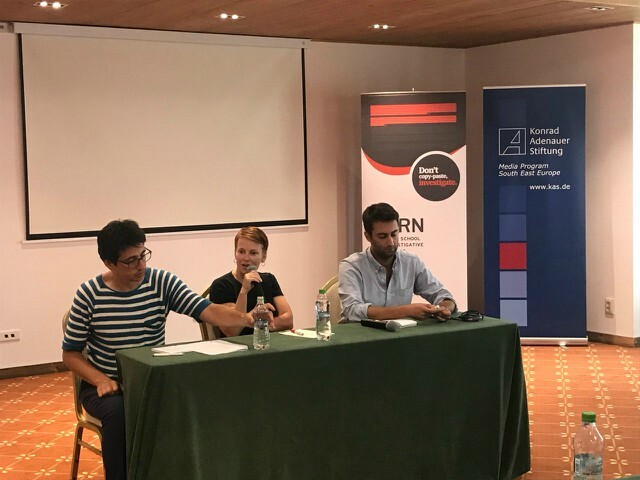 The Balkan Investigative Reporting Network’s Summer School ended on Friday with the participants presenting story ideas that could be funded by the Summer School’s Investigative Story Fund. The Summer School’s 29 participants divided into nine groups and presented ideas for investigations on which they would like to work. The participants proposed investigations into female reproductive rights, air quality, the road industry, Balkan countries’ relations with Turkey and Hungary, illegal trading, smear campaigns and police dealings with private companies. Each group gave a presentation of the outline of their proposed investigation and answered questions about the scale of their story, why it is important and what impact they expect. The best three story ideas are being chosen by a jury composed of Reuters investigative editor and Summer School lead trainer Blake Morrison, BIRN’s Regional Director Marija Ristic and Investigative Editor Lawrence Marzouk, and the Executive Producer Podcasting for E.W Scripps national bureau, Susanne Reber, who was also a trainer at the Summer School. The three ideas that are chosen will then receive funding from the Investigative Story Fund. The ninth BIRN Summer School brought together young journalists from Albania, Bosnia and Herzegovina, Bulgaria, Croatia, Greece, Kosovo, Macedonia, Moldova, Romania, Serbia, Ukraine, Britain and the United States. For the first time, the Summer School also welcomed journalists from Moldova and Ukraine. The Summer School is organised in cooperation with the Media Program South East Europe of the Konrad Adenauer-Stiftung, the Open Society Foundations and the Austrian Development Agency (ADA), the operational unit of the Austrian Development Cooperation, with support from the European Union. Investigative reporters have become regular targets in Europe, as populism rises and politicians create an environment that makes violence easier, BIRN’s Summer School heard in Brasov, Romania. Politicians in various European countries have insulted and discredited journalists, populism is on the rise, the press is vilified – and it has led to the creation of an environment in which two journalists were killed in just four months in two European Union states, Malta and Slovakia. Czech investigative journalist Pavla Holcova and Maltese media freedom advocate Matthew Caruana Galizia spoke about this context to participants in BIRN’s Summer School of Investigative Reporting on Thursday, advising them on how to cope with security threats as investigative journalists. “We’ve pushed the boundaries of our profession and are holding people accountable in ways that were not possible before. This brings new dangers,” Caruana Galizia explained. “As a journalist, if you’re good, you’re at greater risk,” he added. Caruana Galizia, a former investigative journalist, witnessed his own mother’s murder in October 2017. Daphne Caruana Galizia, 50, a Maltese journalist well known for her graft investigations died after a bomb was placed under the seat in her car. Holcova, a journalist with the Czech Center for Investigative Journalism, spent a month under police protection and had to cut communications with family and friends, after her co-worker, Slovak reporter Jan Kuciak was shot together with his fiancée at their home on February 21, 2018. Holcova and Kuciak worked together in collaboration with the Organised Crime and Corruption Reporting Project, OCCRP, on an investigation into links between the Slovak government and Italian organized crime. Slovak police also interrogated Holcova for eight hours and confiscated her cellphone. However, she said, the investigation hasn’t made much progress, despite pressure from the public in Slovakia. “There is no information coming from the Slovak police. The only info we get is that the investigators are making mistakes,” she said. She believes that investigative journalists risk their safety when pursuing a story and that they need to spot the signs of threats, such as being followed. Galizia explained that both he and his mother were followed for months by her assassins. “I had this feeling that my mother was being followed,” he said. “I woke up every day and told myself to check the bottom of the car. I did not check that morning,” he added. After his mother’s murder, Galizia quit working as a journalist and focused on advocacy. He is now working on ways to protect journalists from violent attacks and on legal ways to pressurize government into respecting the freedom of the press. Holcova also said that regaining the public’s trust and support is also important for journalism. “That’s what we should rely on. We need to explain to society that they need us, that they need the information we provide and that they need to trust the media. “We can’t rely on international bodies, but we need to regain the trust of the public, because without us the people in power would not be accountable for their actions,” Holcova said. BIRN’s Summer School continued on Tuesday in Poiana Brasov, Romania, with sessions exploring fact-checking strategies, how to mine financial reports and using metadata for investigative stories. Blake Morrison, investigative projects editor at Reuters, introduced participants at the BIRN Summer School of Investigative Reporting to fact-checking strategies and conducted a hands-on exercise exploring the differences between supposition and proof. 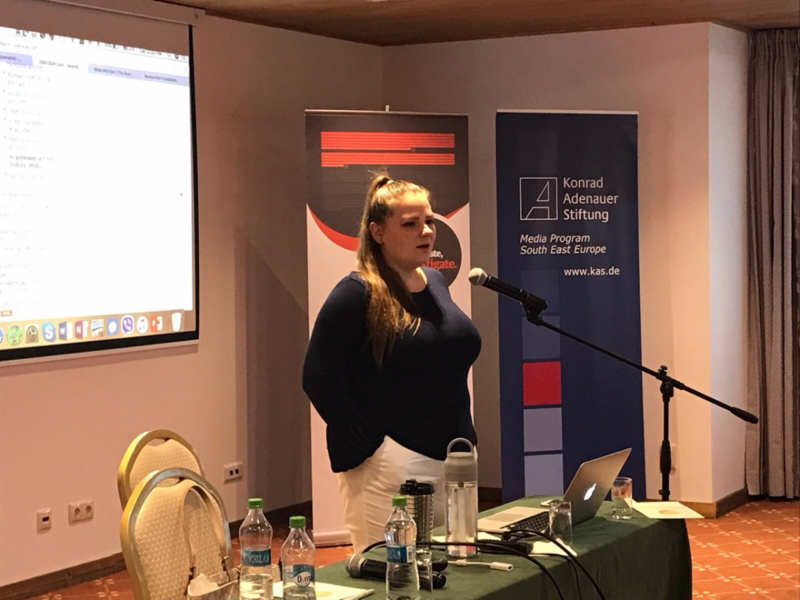 Miranda Patrucic, editor with the Organized Crime and Corruption Reporting Project, explained how to interpret and get the most from financial reports and documents. In the afternoon, New York Times senior video editor Christoph Koettl looked at how to analyse content and metadata in photos and videos. Bellingcat’s Christiaan Triebert introduced participants to open-source investigation and verification looking at how the organisation investigated the downing of the passenger plane MH17 over Ukraine and the 2016 failed coup in Turkey. The ninth BIRN Summer School has brought together young journalists from Albania, Bosnia and Herzegovina, Bulgaria, Croatia, Greece, Kosovo, Macedonia, Moldova, Romania, Serbia, Ukraine, the UK, and the United States. For the first time, the Summer School has welcomed journalists from Moldova and Ukraine. 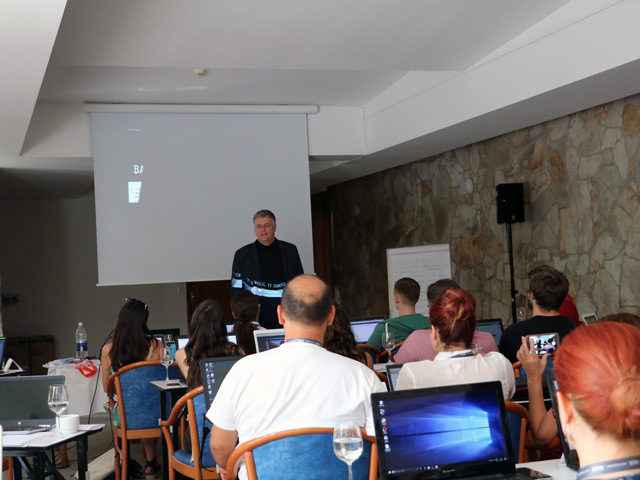 This year’s Summer School started on Monday in Poiana Brasov, Romania, with lectures and interactive sessions on using satellite imagery and digital research in investigative reporting and on how to push for accountability. 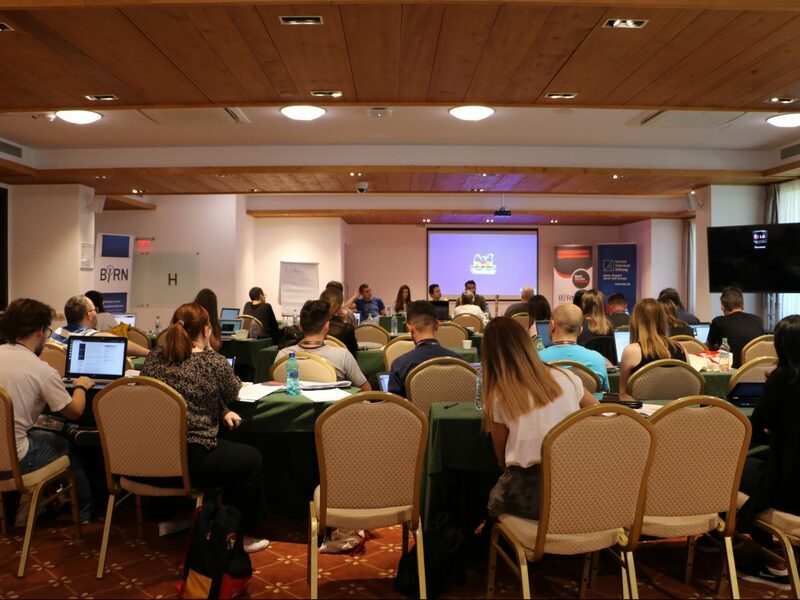 Reporters from the Balkan region and across the world gathered on Monday in the mountain resort of Poiana Brasov, Romania, for the ninth BIRN Summer School of Investigative Reporting. After greeting participants, Blake Morrison, the school’s lead trainer and investigative projects editor at Reuters, held a lecture and discussion about how to imagine a complex investigative story, as well as how to push for accountability. Christoph Koettl, senior video journalist at The New York Times, specializing in geospatial and open-source research, also held an introductory session on using digital research and verification in investigative research. He continued with a lecture on geospatial and satellite imagery used in investigative journalism, followed by an interactive exercise. In the afternoon, the participants discussed story ideas and were divided up into smaller groups for in-depth sessions with Reuters’ editor Morrison. For the first time, the Summer School welcomed journalists from Moldova and Ukraine. The Summer School is organized in cooperation with the Media Program South East Europe of the Konrad Adenauer- Stiftung, Open Society Foundations, the Austrian Development Agency (ADA), the operational unit of Austrian Development Cooperation, with support from the European Union. 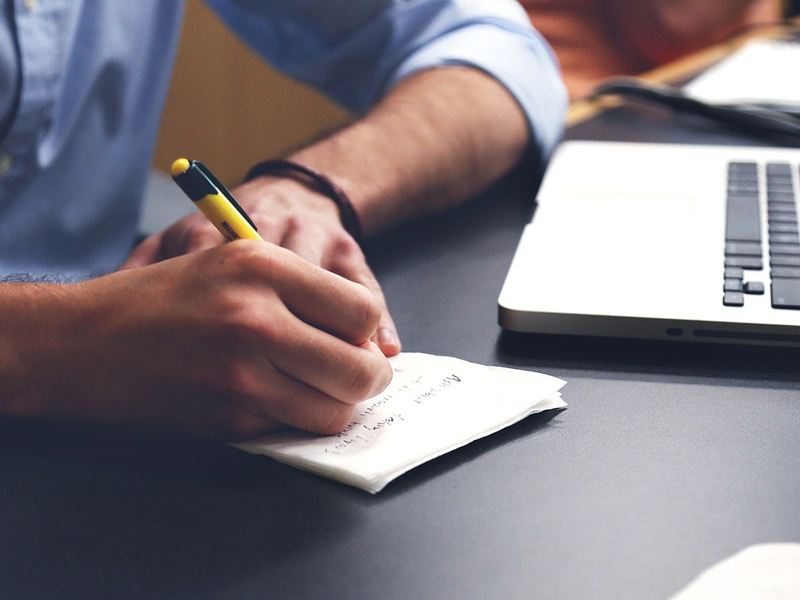 International journalists can apply for an early-bird fee until the May 22th. 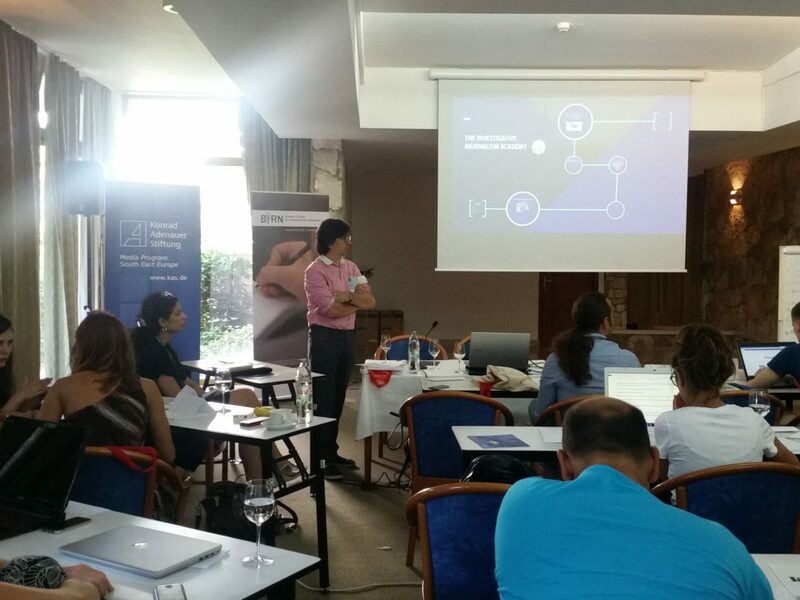 On the fourth third day of BIRN’s Summer School in Dubrovnik, journalists heard how to pitch stories, structure investigative projects and use open data. 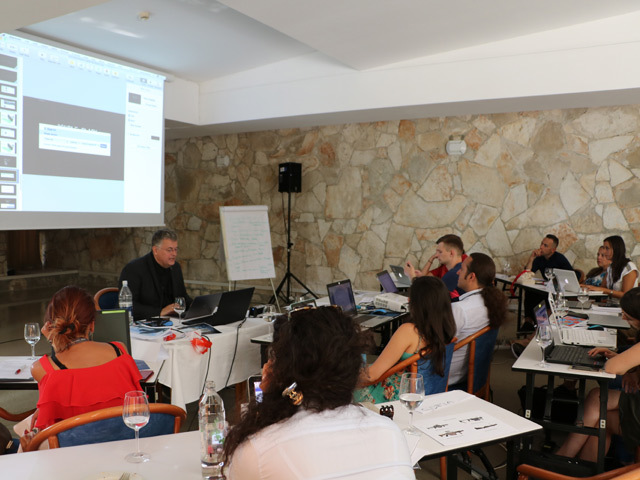 The fourth day of BIRN’s Summer School Master Class of Investigative Journalism in the historic city of Dubrovnik on Thursday started with a session on pitching story ideas, run by Lawrence Marzouk, editor with Balkan Investigative Reporting Network. Marzouk explained how stories can be pitched to editors without overpromising while bearing in mind the possible angle, sources and the outcomes. “You need a clear idea; do not spread a lot of different things,“ he said. Marzouk said journalists should try not promise too much from a story and must be realistic, but their stories have to be fresh and new, workable and possible, to explain why something is important. “At the beginning, you should at least have a theory in your head, something you would try to prove,“ he said. Miranda Patrucic, an investigative reporter and regional editor with the Organized Crime and Corruption Reporting Project, continued her lecture on how to “follow the money“. She explained how to gather publicly available information about companies and how to research their financial statements and assets. “A financial statement summarizes the revenues, costs and expenses incurred during a specific period of time,“ Patrucic explained. In the afternoon session, Blake Morrison, lead trainer and investigative projects editor at Reuters, advised journalists on how to pitch stories and structure investigative projects. “You should always think of how to better communicate the story, to use the audio-video material, the data,” he said. During the last Thursday’s session, BIRN’s Marzouk shed light on a case study about the arms trade from the Balkans and Central Europe to the Middle East. Journalists heard how to use open data to trace and track the arms trade. Marzouk explained that, while researching a “controversial industry” like the arms trade, journalists “have to harvest all the possible open source databases” because the industry is highly regulated, meaning that there is a lot of documentation. During the fourth day, participants at the Summer School also continued to work on their investigation proposals that they will present on Friday. The eighth BIRN Summer School has brought together young journalists from Albania, Austria, Bosnia and Herzegovina, Bulgaria, Canada, Croatia, the Czech Republic, Greece, Kosovo, Luxemburg, Macedonia, Montenegro, Romania, Serbia, Slovenia, Ukraine and the United States. The Summer School is organized in cooperation with the Media Program South East Europe of the Konrad Adenauer- Stiftung, Open Society Foundations and the Austrian Development Agency (ADA), the operational unit of Austrian Development Cooperation with the support of USAID Macedonia. On the third day of BIRN’s Summer School, journalists heard how to conduct interviews and investigate offshore industries. 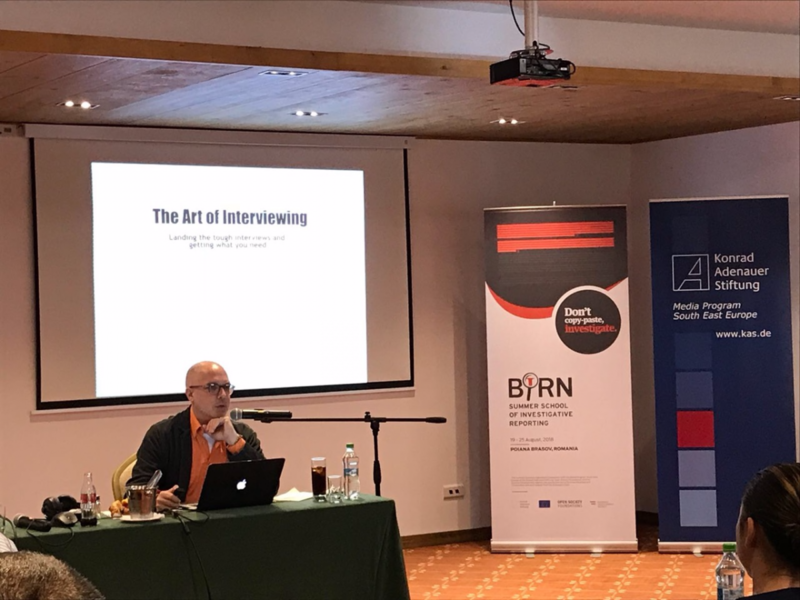 On day three of the BIRN summer school in Dubrovnik, Blake Morrison, the lead trainer and investigative projects editor at Reuters, held a session on the “art of interviewing” and on how to convince difficult sources to talk, describing interviews as a crucial component of the journalistic job. The task was “how to get the information from the people. And to do it ethically,” he said. “My philosophy on interviewing is pretty simple… Think of it as a blind date,” he noted, explaining that the interviewee needs to “be understood. “It’s very important to be curious. If you don’t understand something, don’t presume, ask,” he continued. Morrison explained that there are three types of interview: information interviews, which involve collecting information on something; accountability interviews, asking a person to explain his or her acts; and emotional interviews, in which person sheds light on his or her emotional perspective. Morrison emphasised the need for preparation and gave insight into why some people agree to give an interview: vanity, the need to be understood, self-interest, desperation, guilt and curiosity. “I really believe as a journalist is that our commitment to honesty is crucial,” Morrison said. The workshop on data journalism and using advanced internet research continued on Wednesday. Henk van Ess, who works with a number of European media outlets, as well as Bellingcat, continued his training on data journalism, answering questions from the participants through stories he has covered over the years. He showed the participants how to use open sources and social media for their investigative stories, showing the example of the work he did in tracing the ISIS executer, Jihadi John. Miranda Patrucic, an investigative reporter and regional editor with the Organized Crime and Corruption Reporting Project, also held an interactive lecture on how to “follow the money” and how to investigate offshore industry. She conducted an exercise on tracking money and on shell and shelf companies through various databases, both open-source and paid-for. “Many of offshore companies have a legitimate purpose in the business word, however, they could be manipulated by criminals to hide their crimes, money laundering,“ Patrucic observed. BIRN’s Summer School continued on Tuesday with sessions exploring data journalism and fact-checking methods. 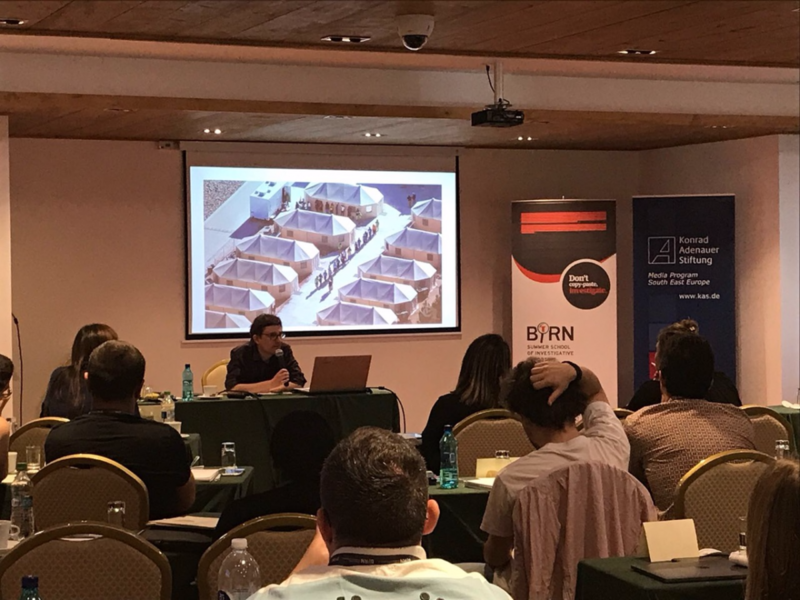 Head trainer and investigative projects editor at Reuters, Blake Morrison, showed BIRN Summer School Master Class of Investigative Journalism how to use a creative approach to fact-checking in Dubrovnik. An interactive exercise explored the difference between supposition and proof and how to separate fact from suspicion, while determining standards for fact-checking. Monday’s workshop on data journalism continued into its second day. Christiaan Triebert, a conflict researcher with Bellingcat, led the group. Bellingcat has achieved notoriety for its utilisation of open source information to investigate armed conflicts and corruption, and has won multiple awards. During the workshop, participants learned about analytical tools required for data journalism, while Triebert explained the process of digital open source investigation, and how it can improve investigative reporting skills. The middle of the session examined the capacity of geolocation tools to pinpoint exact places and how to use satellite imagery as a fact-checking tool. Triebert explained how advanced internet applications such as Google Maps can bolster research underpinning complex investigative stories. “But you will still need traditional reporting and journalists on the ground,“ Triebert said. 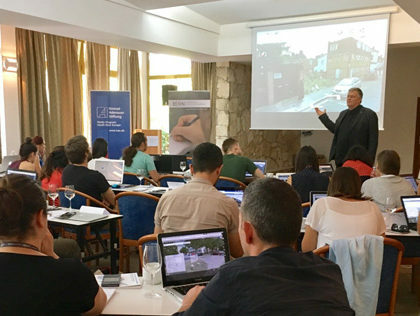 Henk van Ess, who works with various European media outlets, as well as Bellingcat, also provided data journalism training, answering questions from BIRN Summer School participants about using social media as an investigative tool. Journalists learned Facebook data mining methods, how to find elusive people through checking secret IDs, and how to discover closed groups or find people working for security agencies. In short, “how to search over two trillion Facebook postings in a clever way,“ he said.